Red Wine, Green Tea and Dark Chocolate: Can diet help fight prostate cancer? The Men’s Eating and Living (MEAL) study. Can diet help fight prostate cancer? The Men’s Eating and Living (MEAL) study. Few things can make a man feel less in control of his life than being told he has cancer. Making healthier choices — including what food you eat — can help regain some control, and make you feel better in the process. Can adopting a healthier diet help fight prostate cancer? That’s a question men newly diagnosed with prostate cancer often ask their doctors. Several studies have shown that in countries where men eat a “Western” diet containing a large amount of meat, the incidence of prostate cancer, especially aggressive prostate cancer, is higher than in countries where plant foods are a primary part of the diet. Unfortunately, these studies weren’t designed to prove cause and effect. So for now, definitive answers about prostate cancer and diet aren’t yet in — although researchers are actively studying this topic. Investigators have launched a federally funded national study to see whether a diet that’s higher in plant foods and lower in animal foods than the typical Western diet will help control tumor growth in men with early-stage prostate cancer. 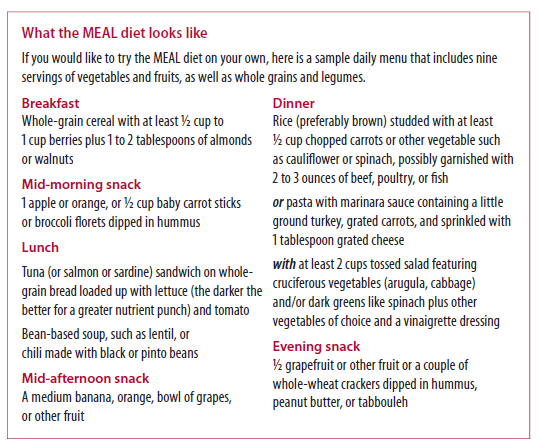 Participants in the Men’s Eating and Living (MEAL) study will try to eat nine servings of fruits and vegetables daily — significantly more than the three to four servings consumed each day by the typical American man — as well as two servings of whole grains and one serving of beans or other legumes. This clinical trial will include men ages 50-80 years who have small, low-grade tumors and who have opted to have their condition followed (active surveillance) rather than undergoing immediate treatment. Researchers will randomly assign participants to telephone counseling about how to achieve the dietary MEAL goals or to a control group that receives standard dietary advice for Americans. During the two-year study, the investigators will collect blood samples to assess levels of antioxidants and nutrients, and then monitor the men with PSA tests and prostate biopsies to determine whether the cancer is progressing. A pilot study showed the approach is workable, and that with enough telephone prompting men can increase their intake of vegetables and other healthy foods. To learn more about the larger phase III MEAL study, or to enroll, visit HERE and search for Trial NCT 01238172.